Compare and purchase top quality brand and generic medications through one of the largest online pharmacies in Canada. 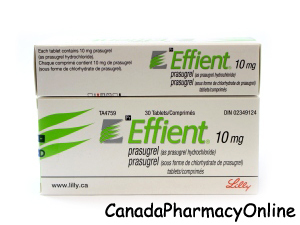 We currently have the brand Effient from Canada and UK manufactured by Eli Lilly. And the generic equivalent of Effient is also called Prasudoc manufactured by Lupin in India. Browse through our website CanadaPharmacyOnline.com and place your order today. You may also purchase Brilinta and Plavix. We do require a valid prescription from your doctor for all RX medications. For more information and further assistance, please call Customer Service at 1866-920-3784. Effient (Prasugrel) is a prescription medication that is taken in combination with aspirin by patients who have heart disease and undergo angioplasty. It helps to prevent heart attacks, strokes and severe chest pain. Prasugrel belongs to the class of medications called platelet aggregation inhibitors or antiplatelets. This medication works by blocking platelets from sticking together and forming harmful blood clots. It helps to keep the blood flowing smoothly in your body. The recommended adult dose of Effient is 10 mg once daily for long term use. You should not take Effient if you are allergic to Prasugrel or if you have any other allergies. Before you start taking this medication, talk to your doctor about your medical history and about all the medications you take including OTC and herbal medications. Effient may cause stomach bleeding. Limit alcoholic beverages. The medication should not be used during pregnancy. It is unknown if this medication passes into breast milk. Talk to your doctor before you breastfeed a baby. There may be a drug interaction between Effient and other medications such as clarithromycin, dabigatran, omega-3-fatty acids, warfarin, etc.